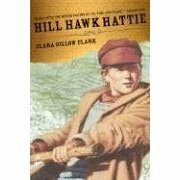 In the late 1800s, Hattie and her father eke out a living in the mountains, chopping down trees and floating them down the Delaware to Philadelphia. It's a hard life, but one made much harder by Hattie's anger at her mother for dying, and her father's unwillingness to accept her (in an odd twist, he treats her as a boy, not allowing her to wear a dress). An unusual historical novel (with way too much to tempt a teacher to assign it for a book report), this shows off a period and a way of life which is probably little known. It's actually a decent breezy read too, but a bit repetitive (the author's favorite metaphor is hawks and she pretty much brings it up every two-three pages or so).